Catholic Charities relies on the generosity of volunteers to help us fulfill our mission of helping those in need. Each year, hundreds of volunteers lend us their gifts of time, talent and resources to help us meet critical human service needs in the six southern counties of New Jersey. We work with volunteers to match their skills, talents and interests to one of the many areas of need we have throughout South Jersey. Explore the various ways you make a difference in someone’s life and perhaps even your own. Browse our current needs for volunteers below and find one that interests you, your group or your family. The truck driver assistant travels in the truck with the driver to the donations locations to assist with pick-up, delivery, directions, and any other tasks. The evening receptionist would welcome counseling clients to the office and contact their counselor to alert them that the client has arrived. Provide a welcoming waiting environment for the clients. Care for child/children during parent’s counseling session. Specific Need on Wednesdays, 4:30- 6 p.m.
Work with program director to coordinate volunteers, logistics, and scheduling of tax preparation services program. Begins in November. Volunteers receive training and certification from the IRS to become free tax preparers in November. Work in Catholic Charities free tax filing clinic during tax season to help low-income individuals and families file their taxes, claim their earned income tax credit, and quickly receive their full tax refund. Help staff set up apartments for refugee families coming to the United States by moving in furniture and supplies in advance of the families’ arrival. Timing: Volunteer would be on an “on-call” basis as the need for apartments arises, usually two to four times a month. Assist ESL (English as a Second Language) teacher in daily class with refugee English learners. Or, work with refugee children while their parents are in class. Drive refugee clients to medical appointments. Requires a valid drivers license. Assist with sorting and organizing thrift store donations and work in the store during operational hours distributing items. Assist with packing bags of food, receiving and organizing donations, stocking food pantry shelves, and finding new opportunities for food donations. We are always in need of volunteers to participate in Catholic ministry in the correctional facilities located within the Camden Diocese. Prison ministry volunteers serve in all nine institutions, leading Bible study, catechesis, communion services, rosary and enrichment groups. For more information, see the contact information below or visit the Prison Ministry webpage here. If you are interested in serving as a prison ministry volunteer, you can directly contact the Prison Ministry Coordinator, Sr. Mary Cronin. The primary task for the Pre-Screening Specialist is to contact potential clients via telephone to determine eligibility for assistance with various agencies throughout Atlantic County. Assist during office hours by welcoming clients for appointments as a receptionist, returning phone calls and screening potential clients, filing, shredding and other office tasks. The Plates for Jesus program provides families who are homeless or living without access to a kitchen to enjoy a home cooked meal. Set aside one plate at dinner with your family, freeze the meal and bring it to a participating Catholic Charities location to be distributed to families in need. This is a service project that can involve the whole family! Please call in advance for instructions on how to package your meal. A complete list of the items on our “wish list” is available here. Or, visit your county’s family and community services center to see the current list of needs in your county. 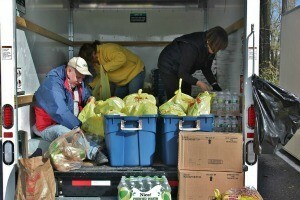 One of our priorities is making sure those we serve not only have enough food to eat, but have healthy foods to eat. Our consultant is available to walk you through the process of organizing a fresh food drive in your community or at your local grocery store. Contact Samantha Astley for more information. Download Catholic Charities’ Volunteer Interest Form (Click and the download should begin automatically). Thank you for your interest in becoming a Catholic Charities volunteer!